Artist and arts educator Yvonne Wakefield leaves a secure career and home life in the Pacific Northwest, so opposite to the climate and landscape she finds when she moves to the little desert state of Kuwait. For six years she will teach art there, to university aged Muslim women, and negotiate tribal and misogynistic land mines set by detractors who are threatened by anyone, especially a spirited American woman, who encourages freedom of expression. 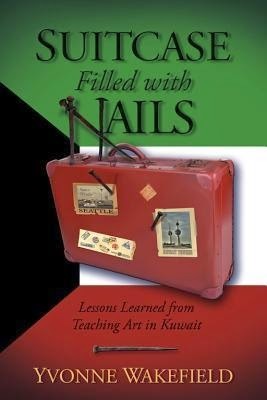 More than a good read, Suitcase Filled with Nails is filled with insights on working, living, and coping in a culture that transcends prevalent Middle East stereotypes. I’m surprised by all that I read, and then to realize that after all she went through she continued to go back year after year. I feel I got a better look into life in Kuwait, even if it was told just from her side of it. I believe there is more than one perspective to any story, and this is hers told from her experiences.One thing I admire is that no matter what happened she continued to fight for those she taught. I know, even though I am an educator, I would not have the guts to go where she went and do what she do. I believe that not only did she enrich their lives but they enriched hers. I received a copy to help facilitate my review. The opinions expressed here are my own.